Figure 19 provides an overview of average performance of sub-Saharan Africa for individual indicators of the EAPI; the spider chart highlights the key challenges faced by the region. The average score of sub-Saharan Africa is 0.43/1, which places the region in the index’s lower quartile of overall performance. The Republic of Congo is the best performer in the index, ranking 53rd globally with a score of 0.55/1, followed closely by South Africa (54th). 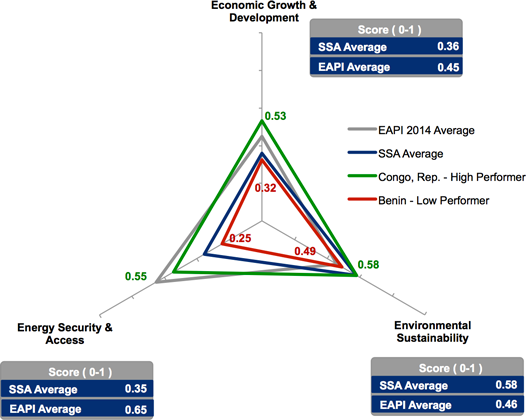 The lowest performer in the region is Benin with an EAPI score of 0.35/1. Benin, along with 12 others of the 17 sub-Saharan African countries ranked in the index, ranks in the lower quartile of the overall index. Low energy access rates across sub-Saharan Africa affect the performance of all countries, highlighting access to energy as the region’s key challenge of the region. Compared with the global average of 0.83/1 in this indicator, the sub-Saharan Africa region achieves an average score of 0.28/1. While low access rates adversely impact the energy security dimension, the prevalence of traditional biomass in the total primary energy supply of the region, and generally low industrial activity, mean sub-Saharan African countries on average achieve higher scores in the environmental sustainability indicators. As countries in sub-Saharan Africa strive to improve access rates and grow their economies, they will need to focus on measures to ensure that these do not come at the cost of environmental performance. he key factors affecting performance across the energy triangle are detailed in the sections below and additional analysis of the energy access challenge is further explored in the concluding section of the sub-Saharan Africa chapter. Unfortunately, due to availability of data for the region, only 17 out of 46 sub-Saharan African countries are included in this study. Scores across the economic growth and development dimension are influenced by the disparity in distribution of natural resources and varying export capacities. Fossil fuel exporting countries tend to have more energy-intensive industries owing to the industrial activity of the sector. In addition, the extended mining activities of the region contribute to the high intensity scores. In efforts to improve access rates, a number of sub-Saharan African countries have instituted fuel subsidies, which negatively impact access scores and, according to the IMF,117 have had limited success in reaching their target group. South Africa is the highest-performing country across this dimension for the sub-Saharan region and ranks in 29th place globally. Over the past decade, South Africa has undergone economic development which has set it apart from other countries in the region, and warranted the country’s inclusion among the BRICS economies. Although South Africa has an energy-intensive economy as a result of its industrial activity, the country’s higher GDP relative to other sub-Saharan Africa countries mitigates the impact of import expenditure relative to GDP. The persistence of fuel subsidies affects scores across the region, with higher prevalence of these in the resource-rich countries; Nigeria and Angola have the highest subsidies in the region for super gasoline and diesel respectively. Addressing subsidies remains a key challenge for both Nigeria and the Republic of Congo in terms of improving the affordability of the overall energy system. The UN estimates that Nigeria spent US$ 7.6 billion, or 2.6% of GDP,118 on subsidies in 2012. Attempts by the government to remove subsidies in 2012 were met with public opposition, which ultimately led to the policy being reversed. The case of Nigeria, along with other countries struggling with entrenched fuel subsidies, highlights the necessity for long-term planning and graduated approach to a subsidy phase-out. Overall, sub-Saharan African countries occupy the lowest rankings globally for the energy intensity of the economy. This is largely driven by low GDP and the prevalence of energy-intensive industries such as mining and fossil fuel production. In 2012, the energy intensity of Mozambique and Togo was around US$ 2 GDP per kg of oil equivalent, making them among the most energy-intensive economies globally. Botswana’s economic dependence on diamond exports makes it one of the exceptions in the region. Diamonds contribute over one-third to the country’s GDP.119 Although mining is in general an energy-intensive industry, the high value of exports compared to the energy needed to extract them and the overall lack of other industrial development make the country’s economy one of the least energy-intensive economies globally and the best performer in the region for this indicator. Sub-Saharan African countries receive their highest scores in the environmental sustainability dimension of the index. 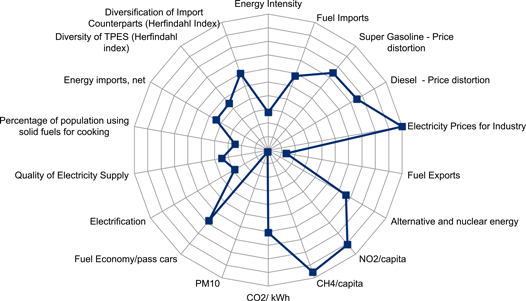 The use of traditional biomass for energy along with the small power-generating capacity tied to low electrification rates contribute to this high performance, affecting scores on low-carbon fuels in the energy mix and other emission-related indicators. However, the resource-rich countries face increasing challenges in the environmental sustainability from their production and refining activities. Due to low access to modern energy, traditional biomass continues to play a dominant role in the energy mix of sub-Saharan Africa, thus affecting scores for countries across the environmental sustainability dimension. The best performing countries in environmental sustainability – Ethiopia, Mozambique and Zambia – receive over 90% of total primary energy supply from non-fossil fuels supplies, predominantly traditional biomass; 12 out of the 16 countries scored for the region rely on traditional biomass for over 50% of their primary energy demand. The inability to split out tradition and modern biomass poses two challenges for countries in the region: first, it limits the ability to track progress on transitions from traditional to modern, more sustainable biomass in the future; and secondly, it fails to account for the environmental impact of deforestation and the health issues related with the use of solid cooking fuels. Sub-Saharan African countries are among the world’s lowest performers in the energy security and access dimension of the triangle. Although resource-rich countries such as Nigeria and the Republic of Congo receive high scores for the net energy export indicator, energy access, poor quality of the electricity supply and the continued use of solid fuels for cooking negatively impact scores across this dimension. The energy security landscape varies greatly throughout sub-Saharan Africa. The Republic of Congo, Angola127 and Nigeria export over 100% of domestic consumption. If and when they are commercially developed, the recent large gas discoveries in East Africa and the shale gas potential of South Africa are expected to further increase the region’s production capacity. Conversely, countries like Botswana and Senegal imported over 50% of their energy needs in 2012. The diverse spread of resources affects the energy security landscape for these countries, as well as import/export balance-sheets for sub-Saharan Africa countries. Despite the large natural resource endowments of a number of countries in the region, energy poverty, an inadequate electricity supply network and the use of solid cooking fuels continue to be key challenges throughout sub-Saharan Africa. Mozambique and Tanzania have the lowest scores globally and within the region, with an average 15% electrification rate. Similarly, in Mozambique, over 90% of the population still relies on solid fuels for cooking. The success story from the region is South Africa. Its aggressive government policies, private investment and the increasing economic development that has set GDP per capita in South Africa at over US$ 7,000 in 2012 – compared to the average US$ 1,800 of other sub-Saharan Africa countries128 – have supported the steady increase from 66% access rates in 2000 to 83% in 2010. The improvement has been even more significant in rural areas, where rates almost doubled over the same period.129 However, as electricity demand continues to increase, South Africa faces challenges in growing supply at the same rate. In 2010 the country suffered rolling blackouts as demand outstripped the available supply infrastructure. While the power sector in South Africa is dominated by centralized coal generation plants, the electricity strategy of 2010 has drawn greater focus on developing and diversifying the power infrastructure through renewable targets, incentives to fast-track electricity projects by independent power producers and investment into natural gas pipeline connections to Mozambique. An insight piece and an industry perspective from Gib Bulloch, global lead for the Accenture Partnership Development Programme (ADP), concludes the section on sub-Saharan Africa by providing further insight on the current scale and state of the energy access challenge in the region, and the role of business in achieving energy access targets. 115 EIA, Country Analysis, Mozambique. 117 Regional Economic Outlook – Sub-Saharan Africa: Building Momentum in a Multi-Speed World, May, 2013. Washington DC: IMF. 118 EIA, Country Analysis, Nigeria. 119 Botswana, The World Factbook, CIA. 120 Redrawing the Energy-Climate Map, June 2013. Paris, France: IEA. 121 See: Department of Energy, South Africa, http://www.ipprenewables.co.za. 122 Zambia Energy Sector Profile, 2013. Zambia Development Agency, http://www.zda.org.zm/sites/default/files/Zambia%20Energy%20Sector%20Profile%20-%20June%202013.pdf. 123 Population in 2012 of Zambia: ~14 million; of the Netherlands: ~16 million. 124 The score for Nigeria is offset by the use of population as the denominator for methane emissions from the energy sector. Nigeria is the most populous country in Africa, distorting the country’s actual contribution to methane emissions. 125 Redrawing the Energy-Climate Map, June 2013. Paris, France: IEA. 126 Global Gas Flaring Reduction partnership (GGFR). 127 Angola is not included in the Global Energy Performance Index 2014 due to insufficient data. 128 GDP per capita, PPP (current international $). World Bank, http://data.worldbank.org/indicator/NY.GDP.PCAP.PP.CD. The average includes only SSA countries from the index. 129 For the rural population, an increase in electrification rates from 37% to 64% in the period 2000-2012.